The conclusion from listening to NHL commissioner Gary Bettman Thursday afternoon was to decide whether the glass is half-filled or half-empty. rationale for Philadelphia hedge fund manager and potential investor Andrew Barroway’s incentive, Bettman indicated, was the franchise has stabilized and the future looks promising. If Bettman indicated the IceArizoan team, led by Gosbee and LeBlanc, was doing so well in their attempt to revive a struggling franchise, why would another party attempt to gain a majority control. Again, Bettman simply stressed the positive and the business operation of the Coyotes was transformation of the bottom line. At the same time, Bettman was asked about the reported financial losses suffered by Ice Arizona in its initial year of operation. The estimated loss for the first year of the Gosbee-LeBanc regime was placed at $24 million. When IceArizona purchased the franchise from the NHL in August, 2013, one out clause negotiated at the time was financial losses. Should IceArizona loss reach or exceed $50 million before their first five years of operation, then the Gosbee-LeBlanc team could sell and, based on the desire of the new owner, possible franchise reallocation. The question Bettman refused to answer referred to the direction of Barroway’s incentive. Will Barroway be just an investor or entertain a greater vision? 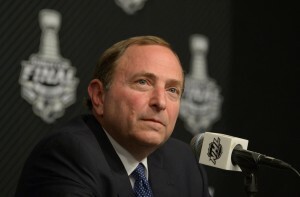 One thing was made certain, Bettman stressed. Carroway contacted Gosbee and LeBlanc directly. Beyond that, any conversation or incentive was not disclosed. Overall, Bettman said the possible acquisition of Barroway was a win-win situation. Again staying away from acknowledging a possible impulse sale by IceArizona and to concede Gosbee and LeBlanc were in over their heads from the start, Bettman continuously made business analogies. Repeating several times, Bettman said the Coyotes are thriving and Barroway wants to participate in an encouraging future. One year after the sale by the NHL to IceArizona, Forbes valued the Coyotes’ franchise at around $300 million. That would be considerably up from the reported price of $170 million in which the Coyotes franchise was acquired. For his part, Bettman said he puts no credence in numbers Forbes presents, “only if the value of a franchise rises by a certain percentage point,” he said. If Bettman was adamantly positive about the state of the Coyotes’ future, he was equally negative toward possible franchise relocation. Still, the current discussion raises old and lingering issues surrounding economic viability. The question for Barroway, at this point, is he willing to absorb such large losses in the desert that the franchise vanishes like the hopes and dreams of the past.